So you may have heard about the fires in California. It is that time of year. There are always fires in California. There is a fire season, just like there is a tornado season and a hurricane season. It happens. The problem with this year is that we are in a bad drought. The fact that we have no water to spare is what makes it so bad. I did also hear that one of the fires – there are hundreds of fires burning right now, twelve of them are being called major fires – is the worse that we have had in a very long time. I keep reading stories of people losing their homes and animals. But I am also reading a lot of really nice stories. Have you seen any of those? There is one ranch who has offered to house people. Of course, I can’t find the original post that I read, but there are others who are making offers. 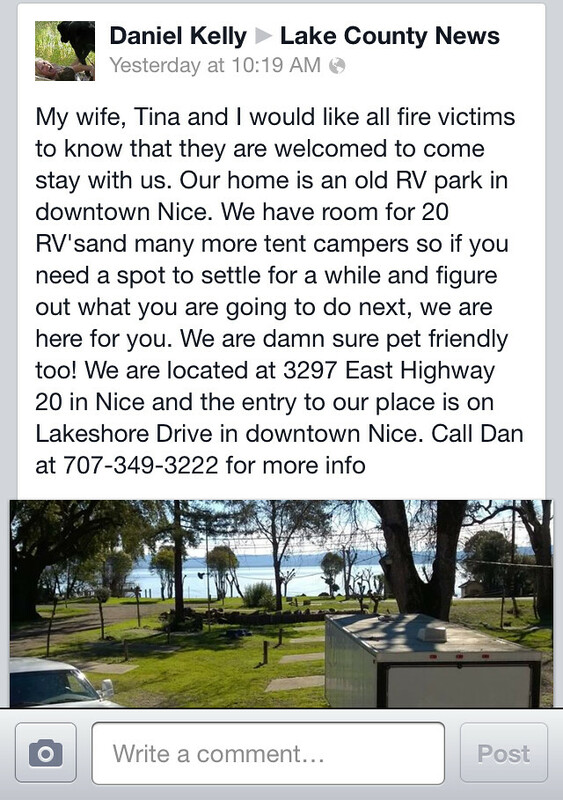 Here is a picture of one of the others who are offering a place for people to stay. “UPDATE: We have a huge warehouse arranged by Brenna Sullivan at the Farm Burearu (no relation…we don’t think) The first semi is arriving mid-morning and will have a squeeze there to unload. 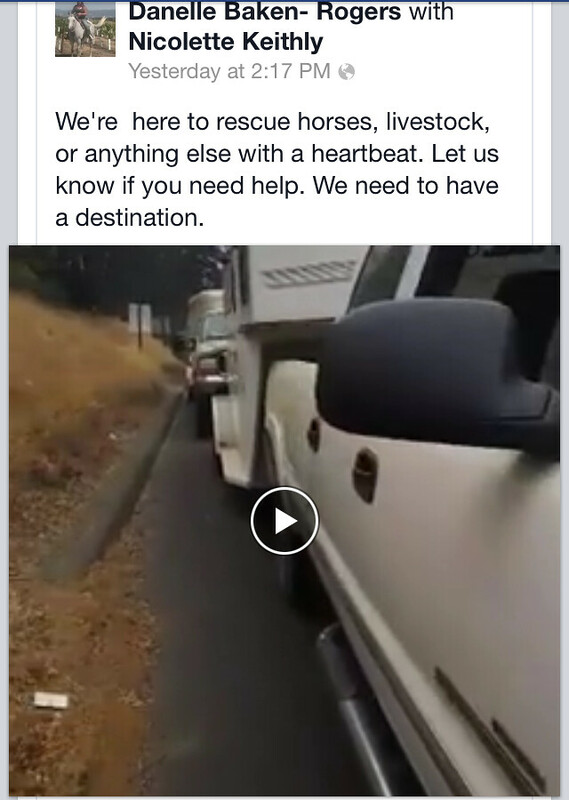 We have dispensed over $1000 from the Lakeport stores to folks with multiple horses on their property, just today. We are aiming for long term support here so people are not having to make sad decisions down the road after all the hoop la is over. THANK YOU ONE AND ALL for your participation. Suppose to rain…..
UPDATE Tues 2pm: WE HAVE STAGING. In a few hours we will have the final ok on a main storage area for long term storage of hay donations; secure and in Kelseyville. Then let the trucks roll in!! UPDATE Tues 15 am: SAFER would like to start a Page on our Website to help those Fire Victims that have lost precious horses, pets and other animals to post their pictures and stories of love and loss. Send your pics and stories to info@saferhorse.com. In this way we can all support, in this small way, our neighbors in the grief that is a part of loving all creatures great and small. 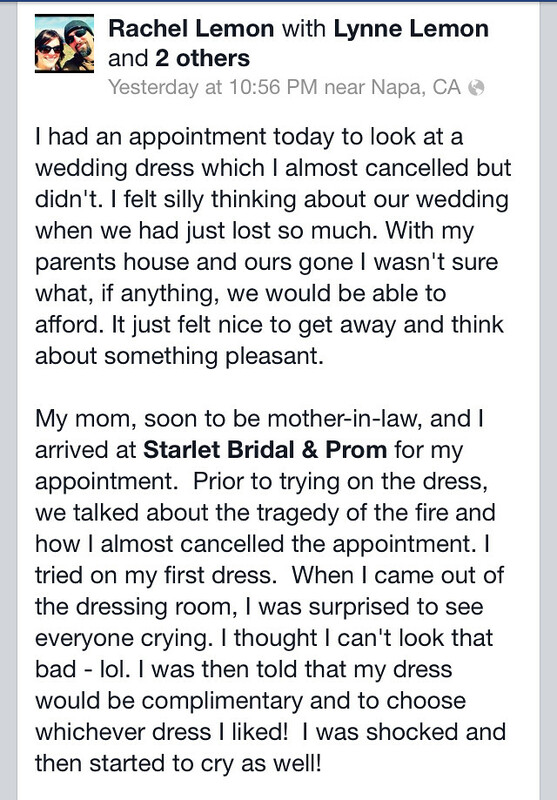 One bridal store gifted a wedding dress to a woman whose house burned down. In addition to a free wedding gown, they called wedding vendors and received donations for everything so she and her groom can proceed with getting married. Now THAT is a bridal store takes care of their brides – Starlet Bridal and Prom! There is so much devastation, it is so heartwarming to see so many people jump to the aide of others. Australia is even sending over 71 Fire Fighters. WOW! 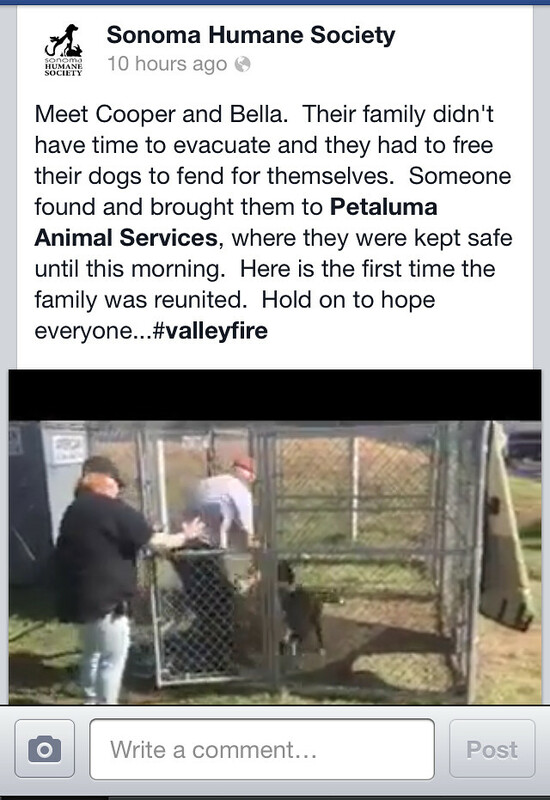 Animals that have been separated from their families are being reunited. It is all so sad. I am clinging to the good stuff people are doing as my heart goes out to all that have been affected. All week long I have been thinking about the Nia Class I am having to Benefit the American Cancer Society’s Relay For Life. I have been thinking and planning, but I waited until the last minute to DO. It is late the night before and I am printing, practicing, creating, thinking, writing, but at least I am not worrying. All week long I felt like the person who plans a party and then worries that no one will show up. Have you ever had that worry? I was worried but then I talked to a few people who said they are going to come. I would like a full house, but I am just glad that I won’t be by myself. As I was thinking about having a party and having no one show up I remembered something about a party when I was young. I remembered being invited to a party. It was a birthday party. I don’t think I knew the girl well, she was one of those quiet children that hadn’t been around for long. Sadly I don’t remember her name, nor do I remember when she left. But I do remember her party. Well, that isn’t even true. I remember at one point I didn’t want to go. I remember hemming and hawing and talking to my mom about not going. But then I decided to go. My mom drove me to the place where the party was. I remember it was a trailer park. I think it was not far from my house. I remember the birthday girl in a dress. I remember us waiting together for more people to show up. No one else came. I remember feeling so bad for my friend. I remembering feeling bad that I almost didn’t even show up myself. This all came to me in a rush this past week as I was thinking, “What if no one shows up?” I remember how hurt my friend was. It made me sad remembering. As I mentioned, I can’t remember much more of the party. I don’t remember a lot of the details obviously, but I do remember I was the only one that went. I don’t think I have ever been to another party where that had happened. I don’t think I have ever had that happen. I usually pester a couple of friends into telling me whether they are coming or not because I DON’T want to have a party and have no one show up. Hosting a party and hosting a class are two different things. I don’t feel it is as bad pestering people about whether they are attending your party, but I don’t feel right doing that when it comes to having a class. 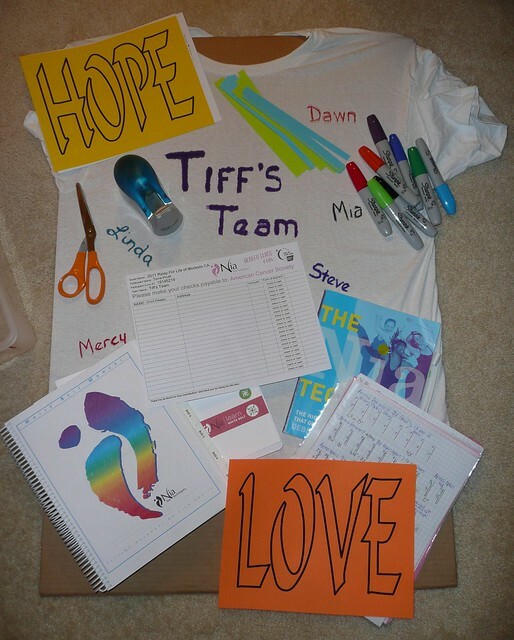 I am just happy that a few people are coming and so I won’t be dancing by myself and I will at least have a few donations to add to the relay. It is odd the things you remember. While I was remembering about my friend from grade school I sent out a little positive thought. I hope that she is doing well. Maybe you can send out a positive thought for me too . 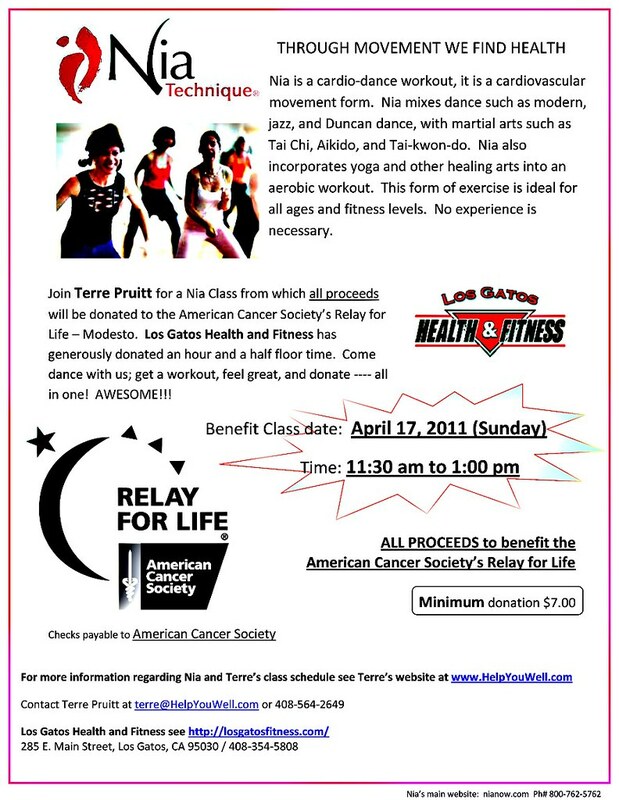 . . help the benefit for cancer Nia class be a success. Thanks!